This simple Artichoke Dip is an absolute crowd pleaser! A cream cheese and sour cream base filled with artichokes, sun dried tomatoes, and just the right amount of seasonings. Serve with veggies, chips, crackers, pretzels, and more! It’s dip season (and I am not remotely upset about it). I’m basically on a campaign to make dip its own food group. I mean, who doesn’t love dip? It can be served with chips, crackers, veggies, or fruit. It can be sweet or savory, warm or cold.Gah! I go crazy for it all. 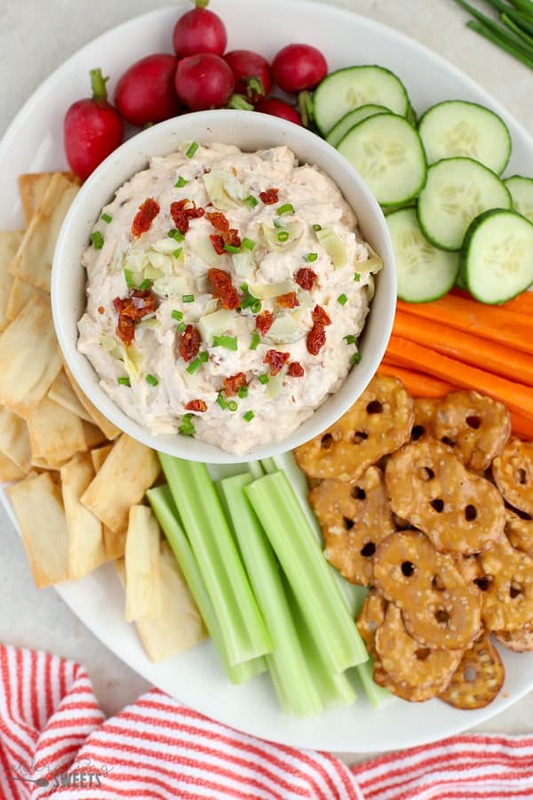 With holiday parties on the horizon, I knew we needed a dip that is sure to be a crowd pleaser. 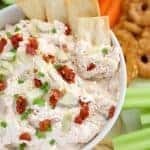 This Sun Dried Tomato Artichoke Dip comes together quickly, it is super flavorful, it keeps well in the fridge, and it is delicious served with a variety of dippers. The base of this dip is cream cheese and sour cream. I thin them out with a touch of milk and give them a whirl in a food processor to make them super smooth and creamy. 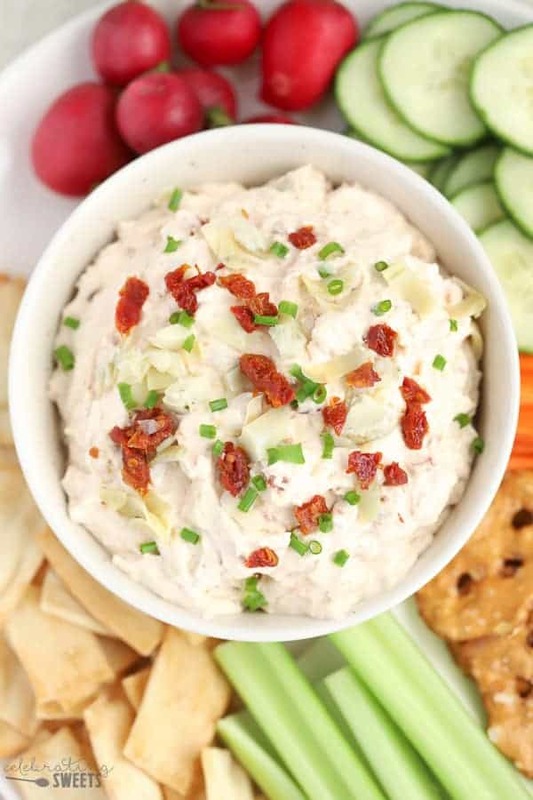 Marinated artichoke hearts and sun dried tomatoes pack loads of flavor into this dip. 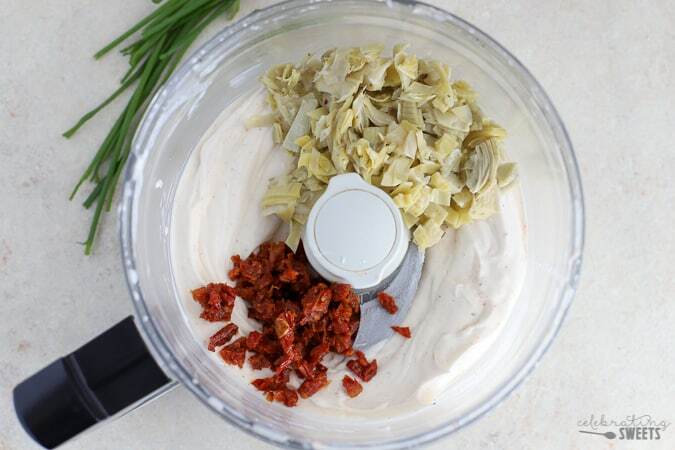 Some of the artichokes and tomatoes get blended into the cream cheese, and some get stirred in for a slightly chunky texture. Smoked paprika, garlic powder, chives, salt, and pepper season the dip and serve as garnish. Once the dip is combined, place it in your serving bowl and refrigerate it until you’re ready to serve. It will thicken just a touch once refrigerated, but it should still be soft enough for dipping. Although this dip falls squarely into “appetizer” category, the truth is I can totally make a meal out of it. Artichoke Dip, toasted baguette and a glass of wine is pretty much the meal of my dreams. 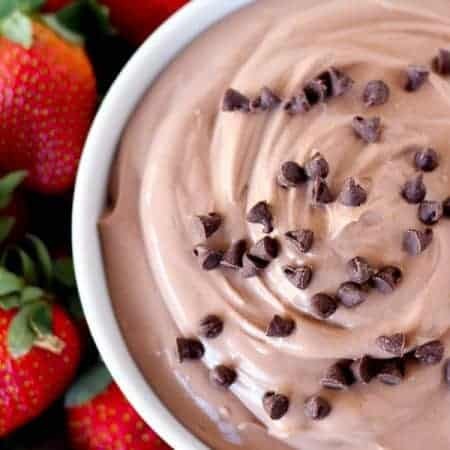 Note: You can also use this dip as a spread – it is super delicious on sandwiches, tortilla/pinwheel rollups, or a toasted bagel. Since this dip is served cold it can be made in advance. I typically make it up to one day before serving it. I like the flavors and texture best when consumed within 24 hours, but leftovers can absolutely be popped into the fridge and enjoyed over the next few days. This simple Artichoke Dip is an absolute crowd pleaser! A cream cheese and sour cream base filled with artichokes, sun dried tomatoes, and just the right amount of seasonings. 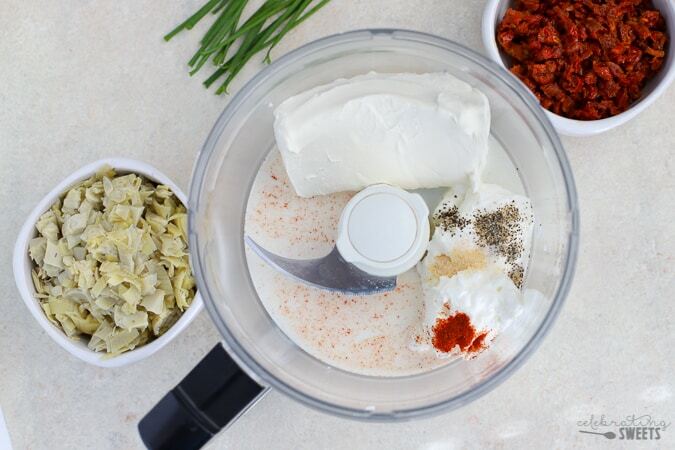 Place cream cheese, sour cream, milk, paprika, and garlic powder in the bowl of a food processor. Process until smooth. Add half of the artichokes and half of the sun dried tomatoes. Pulse several times until the pieces are fine and mixed into the cream cheese, scraping the sides of the bowl as needed. Transfer the dip to a bowl and stir in the remaining artichokes and sun dried tomatoes (reserving a few of each for garnish). Taste and add salt and pepper as desired. Sprinkle the top of the dip with chives and a few reserved chopped artichokes and sun dried tomatoes. Serve with vegetables, bread, crackers, pretzels, pita chips, tortilla chips, or bagel crisps. Sometimes sun dried tomatoes can be strong, which is why I only use 1/2 cup. If you'd like a stronger tomato flavor, feel free to increase to suit your taste. Sun dried tomatoes are so good! 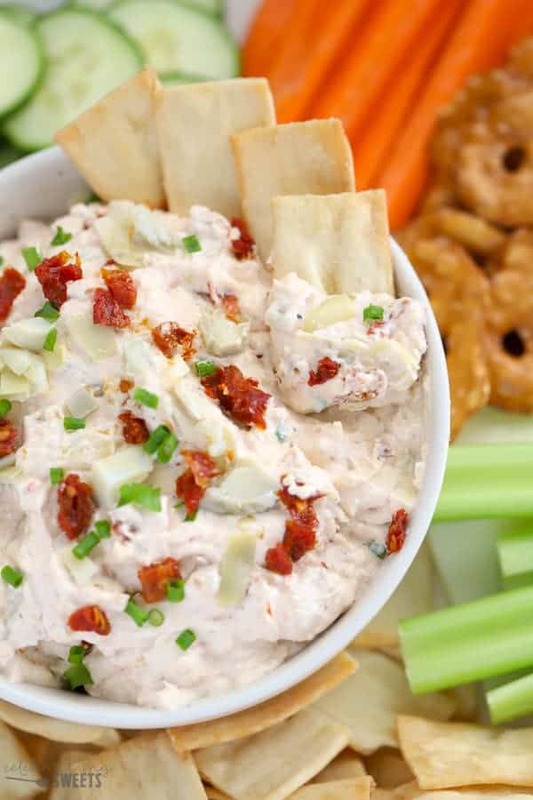 Love this dip recipe, thanks for sharing! My son loves anything artichoke. 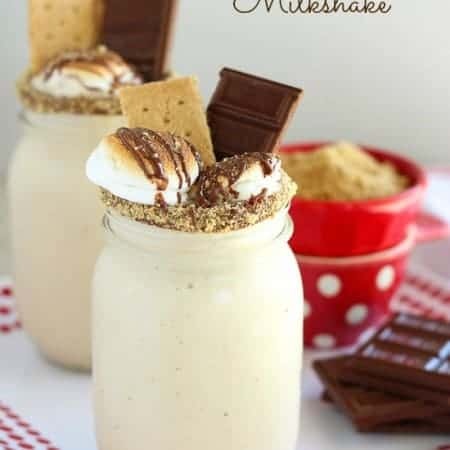 I have to make this for him! Thanks for the recipe. This looks like it would be seriously addictive! Good thing it’s served with veggies! I have a pack of sundried tomatoes I needed to do something with, going to make this weekend! 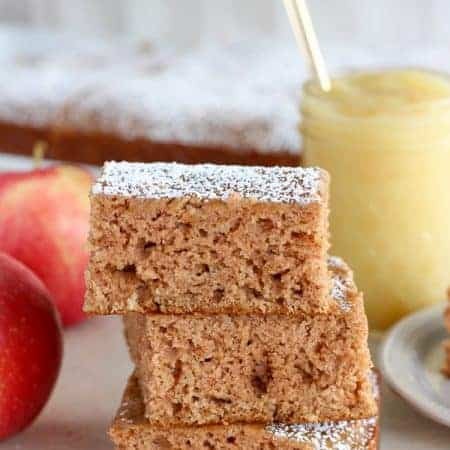 Perfect timing for me to stumble upon this recipe. I need something quick and easy but also tasty for tomorrow night. This is going to be perfect. Thanks.